Coca-Cola, Nescafé and Nivea are among the biggest brands in the world – each contributing at least $10bn (£7.5bn) in sales to their parent companies, according to a 2019 report. The latest Top 100 Megabrands report, compiled by global market research company Euromonitor International, ranked the largest fast-moving consumer goods brands (FMCG) according to their retail sales value in 2017. Global sales of consumer goods reached $4.2tn (£3.16tn) in 2018, with the highest proportion of these sales (29.5%) coming from the Asia-Pacific region. Packaged food brands, including sweets, cereals and crisps, also appear to be the most popular among consumers, with 41 of the top 100 brands coming from this sector. Euromonitor claims the “blurring” of traditional meal times has increased consumer demand for snack foods and goes some way to explaining why so many appear in the top 100. However, consumers have begun to turn against unhealthy products, which could put a dent on the packaged foods industry’s bottom line. The UK recently joined a growing list of countries, including Denmark, Chile, France, Mexico, South Africa and Singapore, in introducing a sugar tax on soft drinks. Although Pepsi, Coca-Cola and Red Bull all feature in the top ten, Euromonitor International notes they “had challenging years and now face a more difficult future”. The report adds: “While packaged food brands are most likely to be megabrands, sales value of this category has declined the most since 2014. The report also pointed to a company’s ability to leverage e-commerce and new purchasing models, such as subscription or one-button purchases, as a key indicator to future success. Coca-Cola, the main product of The Coca-Cola Company, retains the top spot as the world’s most valuable brand. The sales value of the soft drink brand is estimated to be between $35bn and $45bn (£26bn to £34bn). Latin America is the largest market, contributing to 40% of sales with about $14bn to $18bn (£10.5bn to £13.6bn), while sales in Western Europe, Asia-Pacific and North America were roughly $6bn (£4.5bn) each. Recent moves into the coffee, juice and bottled water markets, such as its acquisition of UK cafe chain Costa Coffee for $4.9bn (£3.7bn) from Whitbread earlier this year, show an attempt to rebrand the Coca-Cola Company as a “total beverage company”. Coca-Cola’s main challenger Pepsi comes second on the list with brand sales of $10bn to $15bn (£7.5bn to £11.3bn). It is the most valuable brand owned by PepsiCo, which also owns Mountain Dew, Lay’s and Doritos. The biggest market for Pepsi is North America, where sales were roughly $4bn (£3bn) in 2017. Like Coca-Cola, the sugar tax in Mexico has had an impact on revenue for the brand and countries in the Asia-Pacific region could soon follow suit. PepsiCo responded by launching Pepsi J-Cola – a zero-sugar product – in the Japanese market in 2018. Leading coffee brand Nescafé, which is owned by Nestlé, generated between $10bn and $15bn (£7.5bn to £11.3bn) in sales in 2017. One-third of its sales come from the Asia-Pacific region with key markets in China, Japan and Thailand. However, Euromonitor International says: “Sales in Western Europe — Nescafe’s second-most important market by retail value until 2014 — have declined in recent years. 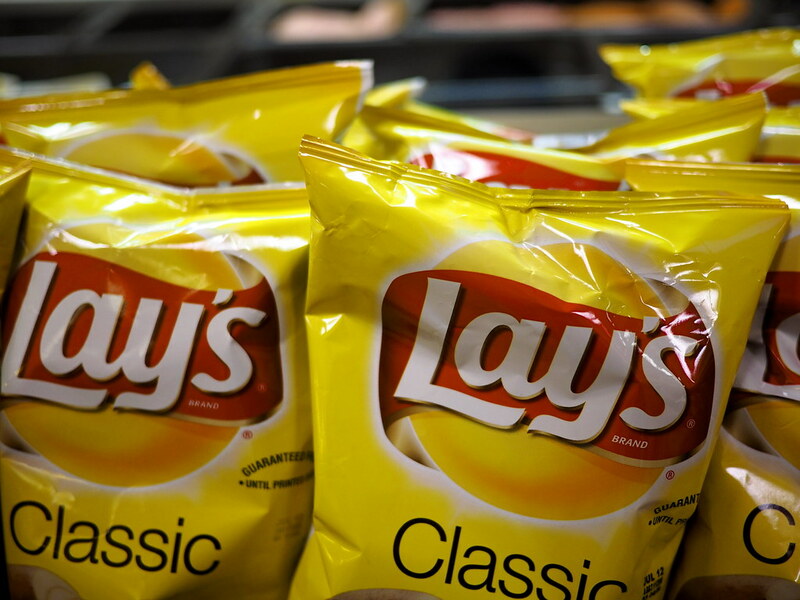 Lay’s, another PepsiCo-owned product, makes the top five with sales in the region of $10bn to $15bn (£7.5bn to £11.3bn). The three most profitable regions for the brand are the US, Mexico and the UK – where it is known as Walkers. Sales in the US contribute $6bn (£4.5bn) in revenue — more than Lay’s 20 next most successful countries combined. Beauty brand L’Oréal Paris enjoys its strongest sales in the US, China and Western Europe. Globally, its total revenue was between $10bn and $15bn (£7.5bn to £11.3bn) after selling a range of products under the banner, including make-up, skincare, hair colouring, perfume and hair care. The brand has not been afraid to experiment with new technology and, in August 2018, launched an augmented reality advert on Facebook that allowed users to virtually try on their make-up products using their phone camera. Energy drink brand Red Bull has moved from ninth place to sixth in the Top 100 Megabrands ranking. This is mostly a result of strong sales in the US and China, which contributed to global revenue of $10bn to $15bn (£7.5bn to £11.3bn). The company has strengthened the Red Bull brand through a number of sports sponsorship deals, including German football club RB Leipzig, Austrian football club Red Bull Salzburg, US soccer team New York Red Bulls and the Formula 1 teams Aston Martin Red Bull Racing and Toro Rosso Honda. Nappy brand Pampers drops three places in the latest report to seventh but remains a strong brand. Owned by Procter & Gamble, it brought in global revenue of $10bn to $15bn (£7.5bn to £11.3bn). The declining birth rates in some of its largest markets represents a longer-term problem for the brand. The laundry detergent brand Tide – along with its sister product Ariel, which is largely sold in different markets – is another owned by the US multinational consumer goods firm Procter & Gamble. Combined sales of the two brands account for 40% of P&G’s home care sales, bringing in $10bn to $15bn (£7.5bn to £11.3bn) in revenue. The company has recently gone through a phase of consolidating many of its smaller brands, either combining or dropping more than 100 products over the past year, in order to focus on sales growth for its top-selling items. Beauty and personal care brand Nivea also achieved sales estimated to be between $10bn and $15bn (£7.5bn to £11.3bn). Nivea is owned by German multinational Beiersdorf, which also owns plaster brand Elastoplast and Chinese hair care product SLEK. China is one of Nivea’s emerging markets, but Western Europe remains the company’s strongest market in terms of sales. Huggies is another nappy brand to make the top ten with sales of between $10bn and $15bn (£7.5bn to £11.3bn). It’s the best selling product owned by US multinational corporation Kimberly-Clark. Key markets are North America, South America and Asia Pacific. Due to declining birth rate figures and competition levels, Kimberly-Clark announced it would discontinue the Huggies brand in most European countries in 2012, with the notable exception of Italy. Apple TV+ is here – But why does it feel like the next Tidal? Will these innovations make disposable coffee cups obsolete?